Surf mats are amazing. One of the greatest surfcraft in existence! That might sound like a bold claim. Even a biased one and probably is if I’m honest but I’ve ridden most and these things seem to have it all (plus a little bit more). How can a cut down air bed possibly be anything special? The short answer is that they are fast, smooth and connect you to your immediate environment in a way that no hard board can. Only bodysurfing can come close to providing the same level of live feedback from the ocean and even then, it could be argued that you still miss out on the truest of glides. Think of the cushion of air under a hovercraft. That’s basically what you’re riding. It allows you to connect to the ocean in an extraordinarily pure way, whilst simultaneously being disconnected, hovering over the wave like a sea bird riding the updraft of an offshore breeze. Modern performance surfmats are made from super-strong, super-light PU backed nylon. This is certainly not the stuff of airbeds! The nylon soaks up a thin sheen of water making a super-slick surface which is as close to water on water as you can get. Mat surfers work hard to find the perfect balance between speed and hold. Basically, the softer the mat, the faster it goes and the harder it is, the better the hold. Matters are always aiming for the perfect level of de-flation. Mat surfing legend George Greenough coined the phrase “Magic Towel” to describe this phenomenon after discovering that his old, leaky mats went better towards the end of his sessions! Experienced mat surfers will regularly be seen riding mats with inflations so low that the mat will easily fold back on itself, 180°. This sounds counterintuitive but you need to throw the rules of hydro-dynamics relating to rigid craft out of the window and start with a clean slate. Hard objects inevitably experience resistance, however a mat at low inflation will give a virtually friction-free ride; moulding itself to the wave face inch-by-inch, second-by-second, turning far more of the wave’s energy into forward speed. 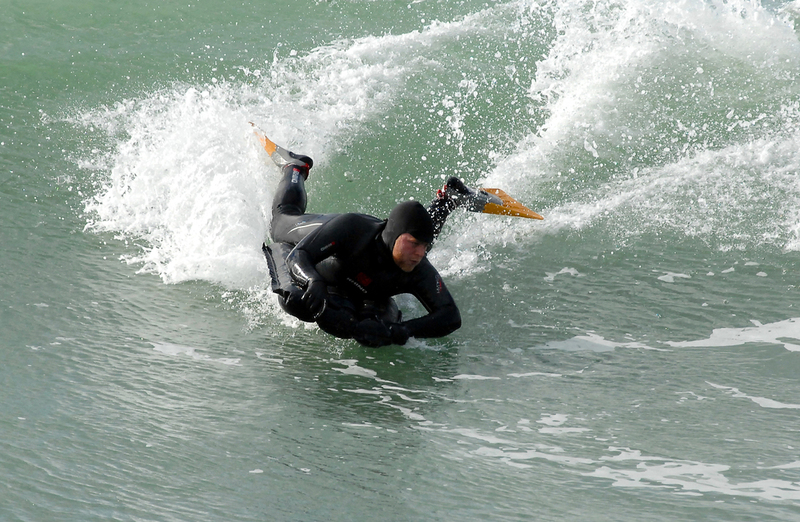 Although ridden prone, mats are certainly nothing like bodyboards. Due to the pliability of surfmats, body positioning and weight distribution determine factors such as rocker and pivot points. They are typically ridden with your chin just above the nose of the mat. Unlike bodyboarding, mat surfers aren’t propped up on their elbows as this serves to stall the mat. Instead, shoulders are positioned over the hands, elbows tucked in with the hands on the deck near the front... kind of like the aquatic version of the Skeleton Bob! The aim is essentially to keep the mat as flat as possible to reduce resistance and maximize speed, squeezing the rails when needed to increase hold then releasing to kick the mat up through the gears. Less is often more and as long as you can keep your line, all’s well. Mats really want to fly... Your job is to let them! Mat surfing is simultaneously the most shared and personal of experiences. A continual growth curve, not just in terms of technique, but also of psychological and spiritual development. I have yet to discover a more mindful activity. The perfect flow state and the most exquisite metaphor for how life should be lived. More on that later though because of all these things, it’s the shared experience which makes riding mats so special. The magical bond between mat surfers is unlike anything else in modern surfing. There are matters all over the world and one of the fastest growing and tightest communities is in the UK. Since the inception of the UK Mat Surfers movement 18 months or so ago, mat riders have been hooking up and the results have been amazing. The five “Mat Meets” held so far are reminiscent of those stories of the early days of modern surfing when everyone smiled, were pleased to see each other and just got stoked off each other’s stoke. The vibe is always good when matters get together and we really do love to get together! When a clan of mat riders are in the water, the drop-in rule goes out of the window. The best waves are party waves and the greatest joy is seeing the beaming face of one of your brethren as he/she flies above, below or straight over you squealing like a kid on a water slide. The generosity between mat surfers is also outstanding. It’s not uncommon for a mat to be bought and then circulate between surfers without a further penny changing hands. The “long-term loan” is common place with mats, fins and anything else drifting around an inflatable kibbutz for so long that people forget who the original owner is! New-comers are welcomed with open arms and not a hint of suspicion and often go home with a quiver of loaners to try. Imagine that... In the 21st century too! There is no sense of being the best. When we say that the best surfer is the one having the most fun, we actually mean it! You only know the half of it mate! Finally, I think it’s worth revisiting what we learn from riding mats. “Getting on in life” is a matter of perspective. Riding mats is all about working with what’s around you; being connected to your environment, fellow creatures (including the people) and yourself. If you aren’t, it all goes wrong and struggling just makes things worse. Ease back, let go, do what feels right and you’re in for one hell of a ride!